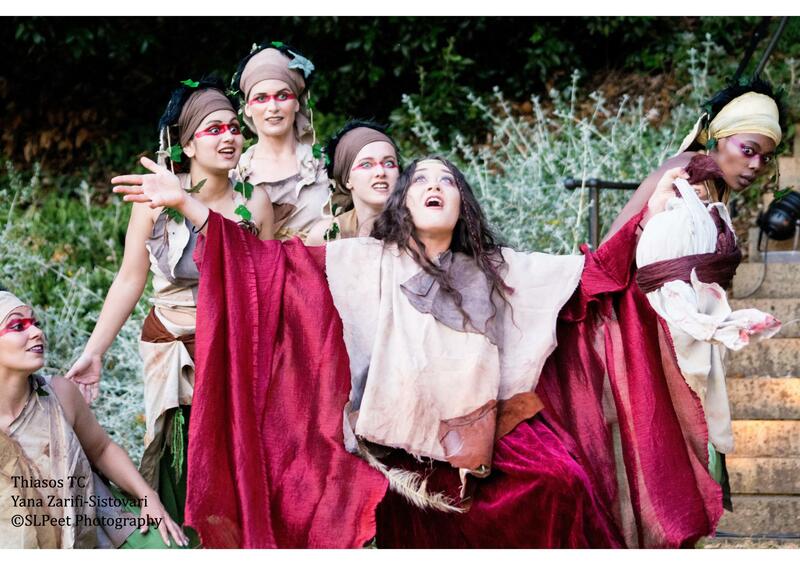 First performed in the summer of 2017 in the glorious grounds of New College, Oxford, the London-based Thiasos Theatre Company’s vibrant and deeply ritualized production of Euripides’ Bacchae has recently received an exciting revival in the very differently spectacular setting of Gardzienice, the home just outside Lublin of Poland’s leading theatre company. New College Gardens afforded a backdrop of a vast, ten-metre-high, tree-planted mound, which doubled as Mount Cithaeron, the place to which the women of Thebes have fled before the start of the play in order to worship the newly arrived god, Dionysus. And it was from the top of this mound, in front of a long flight of stone steps, that the victorious and vindictive god chillingly appeared at dusk at the end of last year’s production. Dionysus, aloft, not only overwhelmed those dazed and defeated mortals from the house of Thebes left in tatters beneath; he also exercised his spellbinding powers over the spectators seated in deckchairs on the College lawn below. In Gardzienice, the audience was more conventionally seated inside in the raked seating of the relatively small but hugely flexible studio space of what is rather deceptively known as the ‘Shed’. The Shed, one of a number of available performance spaces at Gardzienice, has the potential to open out onto wild gardens; in the opening scene of Thiasos’ Bacchae, the chorus of Asian maenads surged forward from this verdant space in the distance (in Oxford they entered less forcefully from behind the deckchairs) before thronging the performance area proper to begin their frenzied celebration of Dionysus. Although the Company no longer had any mound from which the deus ex machina might appear, they found a creative and effective alternative: Dionysus loomed out of the now-darkened wild space beyond on stilts – towering above the cowering mortals beneath. And this year, Scott Middleton, who seems to have grown even more confident in the role of Dionysus, adroitly brought allure and menace in equal measure to these final moments. Thiasos Company’s performances have won international acclaim for their unique blend of music and dance. 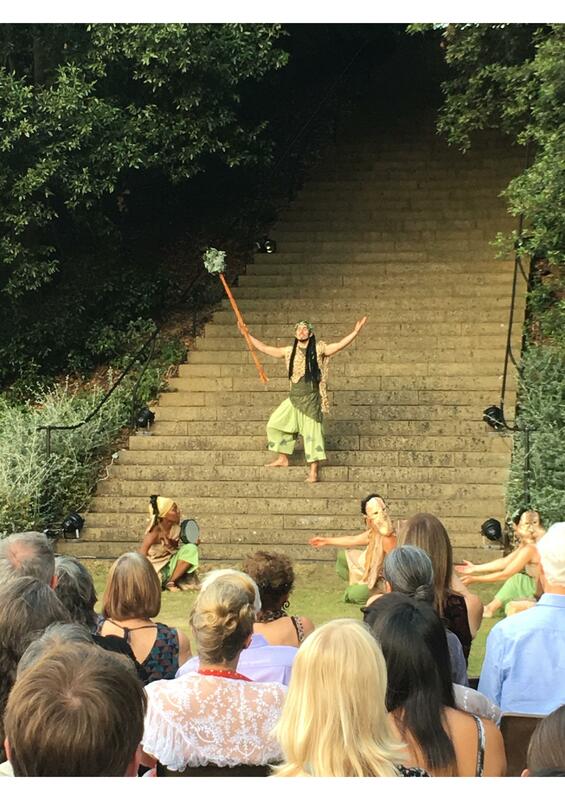 The first to put the company on the map was an intercultural production of Euripides’ Hippolytus that drew on Balinese dance traditions and premiered in Cambridge at the Classics Triennial in 1998, subsequently touring to Cyprus and Dartmouth College, USA. 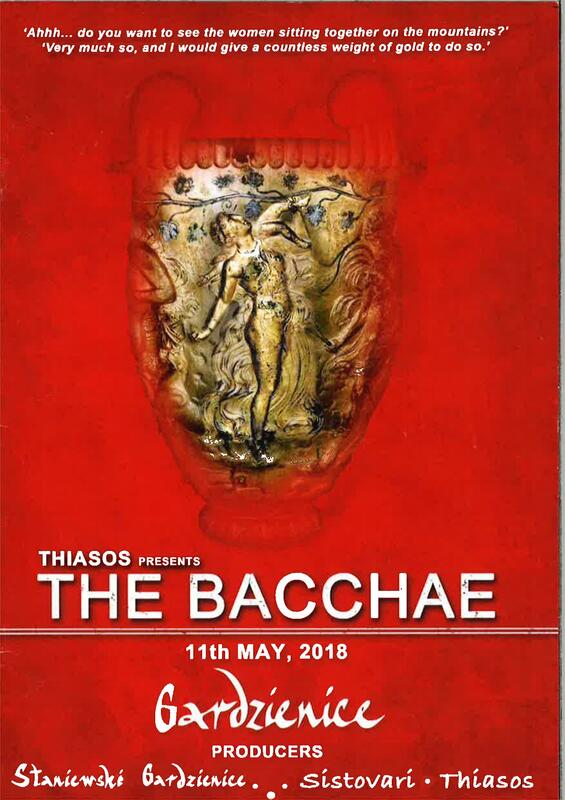 Their Bacchae began life in 2003 in London, in a translation by Richard Seaford and a production directed by Yana Zarifi and M. J. Coldiron, whose successful partnership oversees the current revival as well. The stunning designs from 2003, by the distinguished stage designer Ab’Elkader Farrah, have also been included in the revival. This is a deeply ritualistic – almost Nietzschean – production which seeks to establish the centrality of dance to religious ritual and celebrates the communalities of collective movement. The chorus is very often an embarrassment in productions of the Bacchae – witness the tuneful but totally implausible school-choir-like maenads who graced the stage but barely moved during the Almeida Theatre’s Greek Season production in 2015. Here in Thiasos’ production, by contrast, it was the chorus that provided the pace and the pulse in this high-octane piece. It is the Company’s chorus-centred productions that have garnered plaudits on the international stage and led to the Company’s return in 2017 for the second time to New College, Oxford (Thiasos’ production of Persians was mounted in the grounds of New College in 2003). The Company’s signature physical and musical experiments also led to the invitation to perform the Bacchae in Lublin (Thiasos had already performed a revival of their Hippolytus there in 2016). Thiasos’ commitment to music, dance and text intersects with the pioneering ensemble methods of the Artistic Director of Gardzienice, Włodzimierz Staniewski. The Gardzienice Company began life on the road in the 1977 as a touring troupe, and has now restored the old palace and built multiple performance venues for its European Centre for Theatre Practices, which trains young actors from around the world and makes new work, often inspired, like Thiasos, by the mousike of ancient theatre. 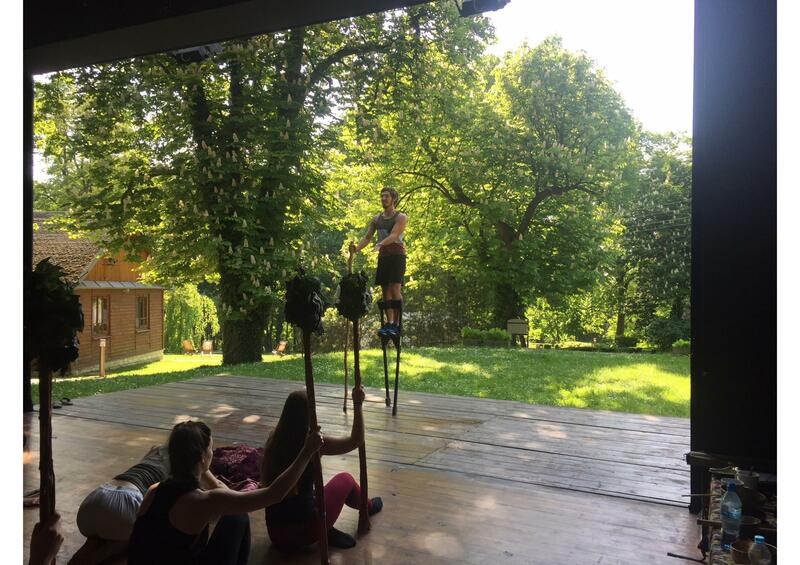 For Thiasos members, performing at Gardzienice didn’t just grant them another outstanding performance space; it also gave them access, through the tutelage of some of the Polish company’s senior actors, to the Gardzienice method that infused their own ensemble performances. 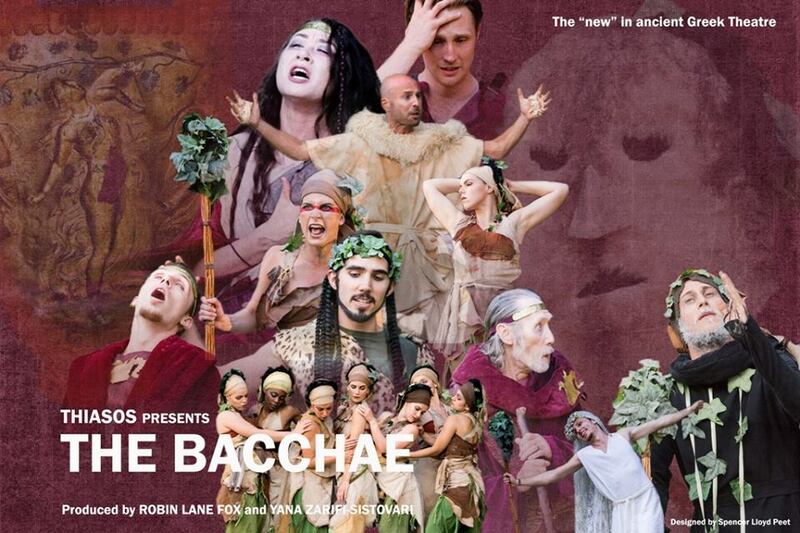 This 2017–2018 revival of Bacchae is marked by two stand-out performances. The first is the stunning intercultural music, under the direction of Manuel Jimenez, that draws on an eclectic mix of Brazilian Candomblé, Eastern European folk traditions and Sardinian cantu a tenore. At its centre is the haunting sound of the launeddas, the Sardinian triple pipes, widely understood to capture the eerie strains of the ancient aulos, and spectacularly played here by the Sardinian musician Roberto Tangianu. The other stellar feature of this show, as in New College in 2017, is the lament sung by Shelby Lynn Gilliam in the part of Agave, who finds a rawness in the lower register that can only come from plumbing the depths of agony. Gilliam left barely a dry eye in the house as she struggled to piece together the body parts of the son she had unwittingly hunted down. As ever with Thiasos’ productions, here was a thrilling synthesis of the arts: under the sure-footed direction of Margaret Coldiron and Yana Sistovari, and with the glorious design palette of Abd’Elkader Farrah, this Bacchae enthralled no less than did the god in whose honour it was originally performed and whose power was terrifyingly on display here.